What’s making breweries like Lagunitas and Flying Dog happy these days? Well, yeah. Beer. But there’s something else. The measure intends to eliminate marijuana from the Controlled Substances Act – once and for all. And it’s just the sort of legislation that these breweries would like to see make it on the books. In fact, nearly every major alcohol company has entered into a deal to launch what they’re calling “drinkable doobies.” And those who aren’t openly making deals are negotiating behind closed doors because, you know, marijuana is still illegal at the federal level. Flying Dog Brewery – rebels that they are – isn’t trying to hide anything though. Wanting to get in on the ground level of this hugely promising industry, they’ve partnered up with Green Leaf Medical Cannabis to produce a THC-infused non-alcoholic beer called Hop Chronic IPA. They hope to eventually distribute their tasty beer to medical marijuana dispensaries throughout the state. But they’ll need to jump through some regulatory hoops first. Their brewery is located in Maryland. And as of now, Maryland medical marijuana officials don’t allow any cannabis operations to sell edible marijuana products. But not everyone wants to smoke or vape cannabis. So Flying Dog’s goal is to give patients another option with this refreshing reefer brew. Flying Dog’s CEO isn’t sweating jumping through the hoops though. He thinks the Maryland Medical Cannabis Commission will sign off on it – given that similar products are already sold legally in other states. Why Is Cannabis Beer Non-Alcohol? Even though recreational marijuana was made legal in the entire country of Canada back in October of 2018, it will take a year from that date for edibles to be legal. That hasn’t stopped them from experimenting with cannabis beer though. Yes, it’s likely that marijuana-infused beer and cocktails will eventually contain alcohol. But right now there’s more focus on creating cannabis beer as an alternative to alcohol beer. After all, the marriage of alcohol and marijuana in the bloodstream isn’t a happy one for many people. So hoping to mimic the rough equivalent of a single does of alcohol, cannabis beer brewers are aiming for each beer to have about 6.5mg of THC. 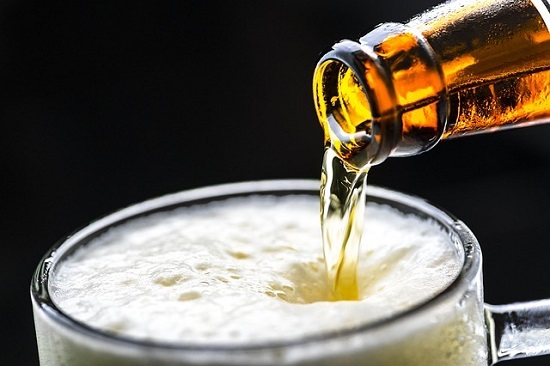 Working in tandem with chemists, brewers have been working on finding the right combination of hops, water, yeast and cannabis, then removing alcohol during the brewing process to create a non-alcoholic beer that offers a marijuana high. At first, the brews tasted like “rotten broccoli.” Mmmmmmm. But now some places have landed on a brew that’s dry, and more savory than sweet. And unlike with other marijuana edibles, cannabis beer delivers its high quickly. So there’s that. Still, some folks are dubious. Does Non-Alcohol IPA Actually Taste Good? When in the hands of the skilled brewers at Flying Dog, it does. Or at least, they claim it does. They’ve been at the beer game for a long time and they certainly know how to get that hop character into even a very low-alcohol beer. So they’re confident that their Hop Chronic IPA is going to be in the running with other solid IPAs on the market. If things go as they’re hoping, their cannabis brew will be sold in six packs and singles. It will also be available with varying ratios of THC and CBD – depending on the consumer’s preference. Kind of like the option to have Coke, or caffeine-free Coke. But if you want it, you’ll need to buy it (AND drink it) in Maryland. Or hold out until the U.S. makes marijuana federally legal. Which could be sooner than you think. With proposals like the 420 Bill, things are definitely looking up. Up high. Are You in the Cannabis Business? If so, we hope you’ll keep checking back with our blog to stay up-to-date on issues like the 420 Bill and other happenings in the industry. And if you’d like to discuss how to improve your marketing and public relations tactics, reach out to us. We want to help you grow and thrive.